Having trouble setting social media goals for your business? Ones you can actually measure and achieve? January is the month for new beginnings. It's the perfect time to assess your social media progress so far -- and where you want to be at the end of this year. And we're excited to help you with the process! Setting goals and then monitoring your progress is an important step to help you get from where you are now to where you want to be on Facebook, Twitter and all your social media channels. 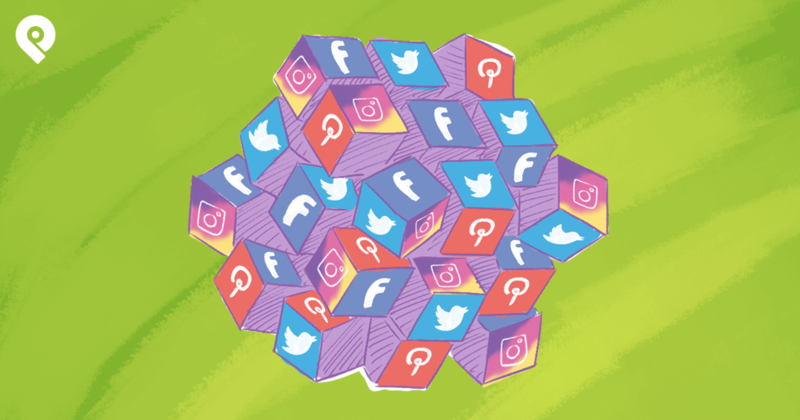 Social media is an effective tool that can support your company objectives -- but just like with any other marketing tool, it's important to focus your efforts. We want to encourage you to set very specific social media goals for your business, and then work each day to achieve them. Once you set your social media goals (and then you start tracking them) -- that's when the real fun begins! 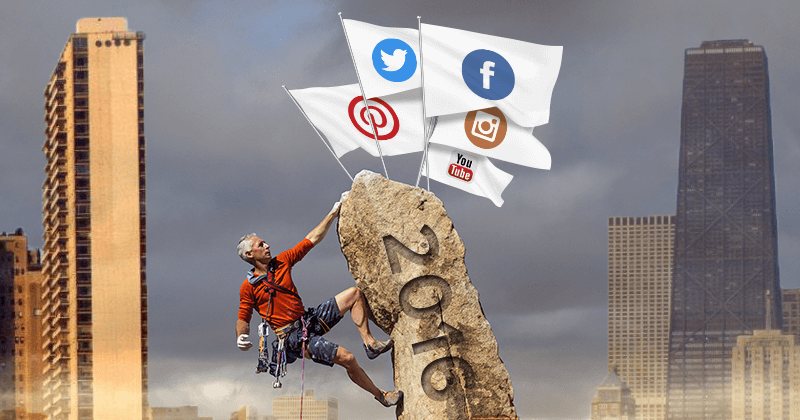 What's the value in setting social media goals? Just in case you haven't done this before -- YES, it's important. Think of it as creating a road map to get where you want to go. Without that detailed road map for success, it's like trying to get to an unknown destination without a GPS. It's no fun -- and it's very ineffective! You might eventually get there, but it will take a lot more time. Setting goals allows you to determine your strengths and weaknesses. From there, you can easily tweak your strategy and make quick improvements. Remember, successful companies set goals! Without them, there's no clear purpose. Embrace it! Personally, I wasn't a fan of doing this when I first started the process. It wasn't easy because I was so used to my own social media routine. But I decided to give it a shot -- and soon I learned my way wasn't the best way to approach it after all. Today, I couldn't imagine not having social media goals! Not only is it motivating to see my progress, but I find myself always pushing to achieve my goals faster. Did I convince you yet? 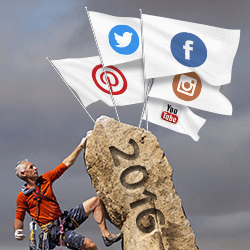 Setting social media goals is fundamental to your social media success. I've simplified it for you and broken it down into 6 easy-to-follow steps. Every goal has to start with a clear objective. You can't get somewhere if you don't know your destination. 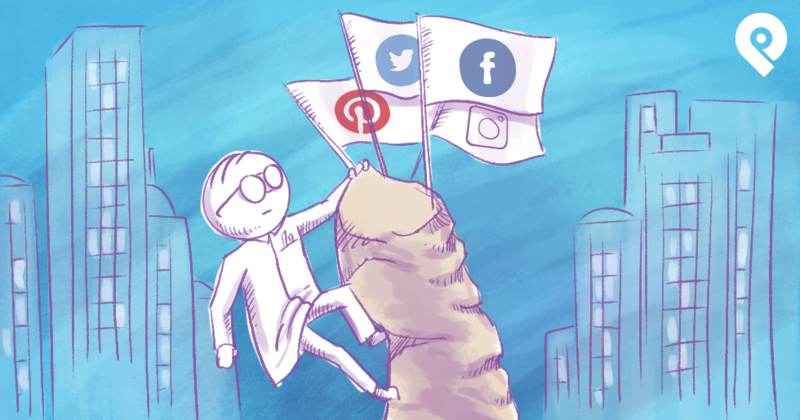 What do you want to accomplish for each social media platform? What do you want to achieve? Be very specific. Do you want to increase more traffic to your website? Do you want to increase sales leads? Get people into your funnel? Do you want to increase engagement and community awareness? Think about these things carefully. Your answers will give you the direction you need to move forward. Without an objective, you'll be driving blindly. Once you've written down your goals -- make sure each one of them is S.M.A.R.T. SMART is an acronym that was coined by George Doran. The first known use of this term was over 30 years ago in November 1981. Back then, it was mostly used as a tool for management reviews in organizations. These days, the SMART acronym appears practically everywhere. I remember learning about it in University. I thought it was silly back then. Boy was I wrong! Make your goals SPECIFIC: Answer the 5Ws below. Why: What's your why? What's that goal's purpose? A measurable goal is a goal that you can measure and track. Measuring your progress is critical for knowing whether or not you're moving towards achieving your goals or moving away from them. Years ago, marketers struggled with measuring social media progress accurately. But in 2016, measuring social progress is much easier. Here are some common examples of measurable marketing goals. Each one of these things can be tracked with the proper formula or tool. It's important that your goals are attainable. If you set them too high -- you'll set yourself up for failure, and you'll end up frustrated. If you set them too low -- you won't be challenged. Be honest with yourself. Your social media goals should support your business's overall marketing goals. All your company goals should fit together like a puzzle to create the path to your overall success. Give yourself a deadline for your goals! You can set weekly, monthly or even quarterly goals. Setting SMART goals will allow you to start working SMART towards your success. In other words, you'll know exactly what you're setting out to achieve and you'll know the quickest path to get there. It's almost time to GO! GO! GO! Well done on completing step 1! I know it was a lot to take in -- but it is important you start with Step 1 first. 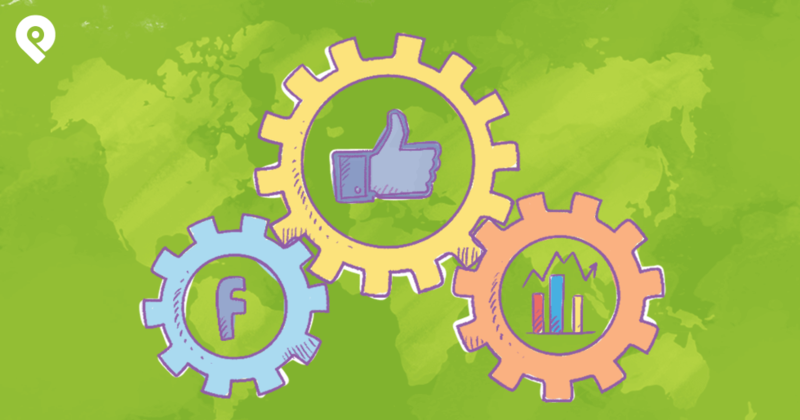 For step 2, it's all about understanding your current social media performance. This will let you know what your current capabilities are. That way, you'll have a benchmark to start working with. It's important you do this audit of your performance on the front end. If you don't -- it's like going on a diet without knowing your current weight. I'm sure you know how that will turn out. Not good! Here are some tools to get you started on getting that benchmark for your current performance. I've found it helpful to use a combination of these tools to begin establishing a benchmark for each social media platform. For example -- if your objective is to increase social media engagement on Facebook, you need to figure out what your current engagement rate is. 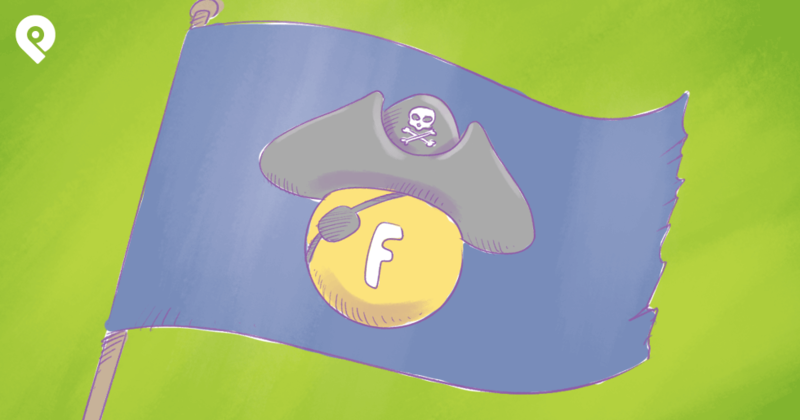 The tool that can help you measure this is Facebook Analytics. Fun fact! The term "OKR" was invented at Intel and made popular by John Doerr at Google. OKRs is short for objectives and key results. Also, many more use OKRs to help them understand their performance. At Post Planner, OKRs play a huge role in our daily activities. While writing this -- I can hear Sam (our amazing COO) talking about the importance of OKRs. 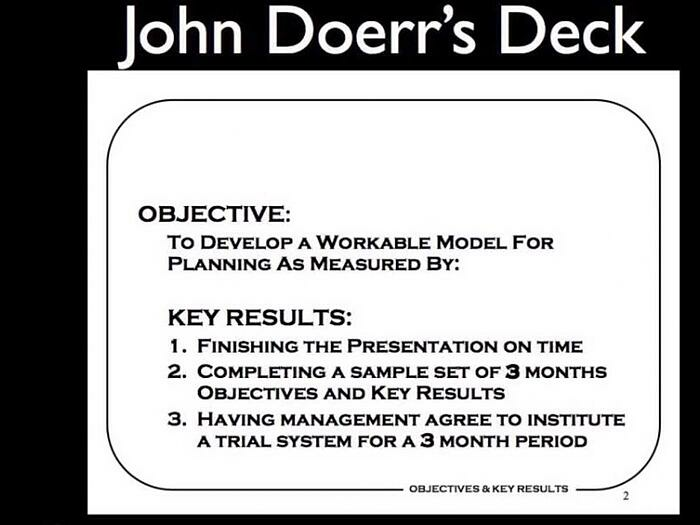 Unlike setting objectives in Step 1, OKRs are individual objectives and key results. Think of step 1 as your macro goals. Setting your social media OKRs will allow you to get nitty-gritty about what you want to achieve. You'll break those macro goals down into a quantitative form. I've found that by breaking down my goals into this detailed format -- it makes it much easier to achieve them. It's black-and-white. No gray areas. Here at Post Planner, OKRs are used to determine the micro goals for each team member. Each person has an individual set of OKRs -- and those are what determine how that person spends the majority of their time every day. Why do OKRs matter for your social media goals? The reason OKRs are important for your social media goals is because they will keep you focused on what you need to do to achieve your objectives. When you update your progress each week, you'll be able to see how you're doing. It will all be organized in one place, and at a glance you'll be able to assess your performance. According to Harvard's Teresa Ambile's research -- there's nothing more motivating than progress in meaningful work. Even if it's slow progress, a person’s sense of steady movement toward an important goal they set can make a huge difference in their performance. When you apply OKRs to your social media goals -- it will motivate your team members and allow them to see their own progress. It's important to review them on a weekly basis. I recommend you start each morning by assessing where you are on your OKRs. It will start your day off right! Here are some examples of social media OKRs. Key results 3: Increase posting frequency to 12x daily on Twitter and 5x on Facebook. 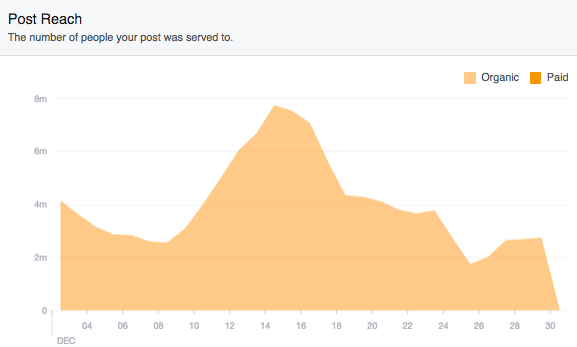 We are constantly measuring reach and content engagement -- and making changes along the way to ensure engagement continues to increase on our Facebook page. 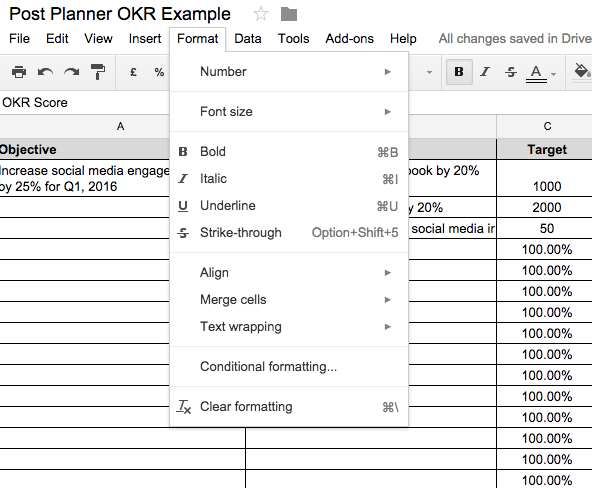 Once you're done setting your OKRs, share them with the rest of the team. That way, everyone will know what each person on the team is doing and how they can support each other. Here's a sample of my OKRs. Aside from measuring progress and performance, OKRs can also be used by the leadership team to give credit where credit is due. OKRs make it easy to reward team members who are continuously achieving their goals. I've done all the work for you. All you have to do is follow the link below! This is what you'll see. 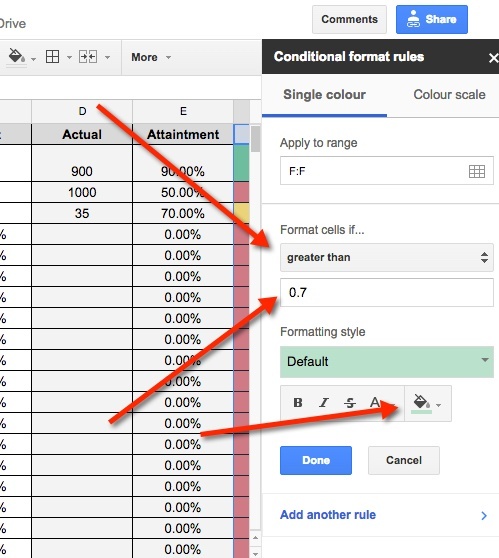 All you have to do is copy it and paste it in a new Google Spreadsheet. Once you've done that -- it's time to fill up your objectives, key results, targets -- and set the color scheme of course. Your color scheme will change automatically as you make progress by hitting certain percentages. That way, you can assess your progress with just a quick glance. Once you're there, set your colors rule like this. To do this, click on 'add new rule' then follow the steps below. 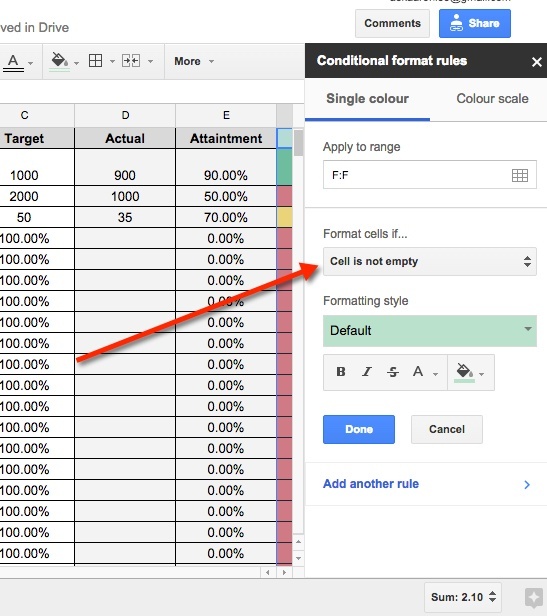 First adjust 'format cells if'. 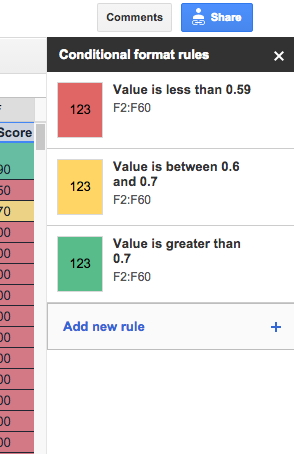 Then set the rule based on the THREE conditional formats I shared above. Click on the 'fill bucket' icon to set the colors. You can follow our colors (green, yellow, red) or pick your own color set. If you want to learn more about OKRs -- here's a pretty neat video I found about how Google sets their OKRs. Now that you've got your OKRs completed, it's time to create your plan of attack. Remember, your OKRs will not show progress if you aren't moving in the direction of your objectives. This step is all about your plan of action for how you'll move towards your goals. How will you achieve this: Use Post Planner to find, plan and post content. Schedule your content at least one week in advance. Get in touch with the top social media blogs and guest write on those blogs. Give away Post Planner accounts to the top influencers and bloggers. As I briefly mentioned earlier, it's important that you measure your OKRs weekly. Doing this will give you the data you need to determine what's working and what isn't. You can use the tools I recommended above to continue to track your progress. Once you've done that -- you need to record your progress. You don't need any tools for this, a simple Google app like Spreadsheet is sufficient. That's what we use at Post Planner to record our progress each week. One of my quarterly objectives is to increase brand mentions to over 25,000 mentions. 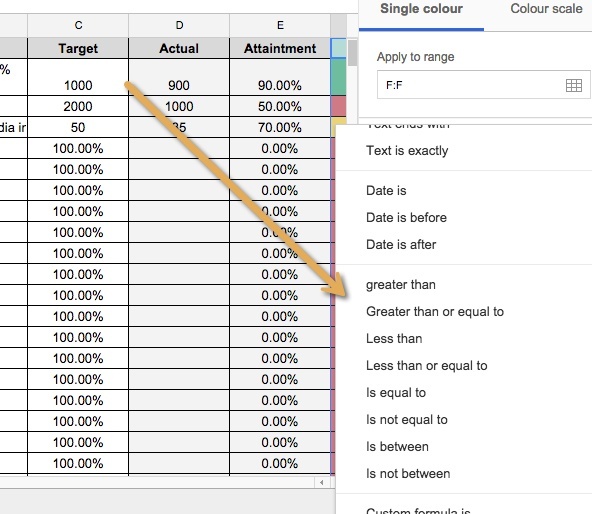 Each week, I track the measurement and update the spreadsheet. As of the time I'm writing this -- I've already hit, 22,000+. What was your biggest strength and weakness in step 5? Repeat and tweak along the way. If you find yourself over-achieving your OKRs -- that means it's time to set more key results or set higher objectives. This will allow you to continue to push yourself and reach your goals even faster. If you find yourself under-achieving them, you can either lower your objectives or change your strategy. Each week, the entire marketing team at Post Planner gets together to discuss our OKRs. 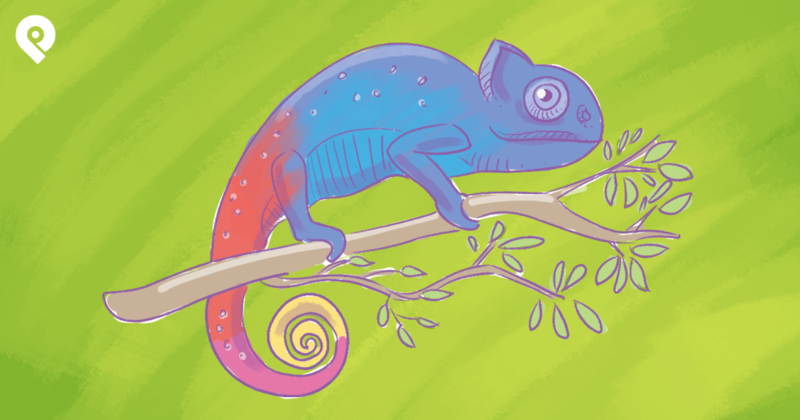 We share our lowest performing OKR, why it was low, and what we can do to improve it. This is why it's important to measure in step 5. Our team members all chip in and share ideas. We support each other as we all try to achieve our OKRs. I know it's a lot to take in. I recommend you bookmark this blog post to come back again as you set your own goals. If you follow these steps for setting your social media goals -- you'll be on your way to achieving success! When I started working at Post Planner, we had one goal and one goal only -- go out there and do the best work we can! Although that sounded great, the problem with that was it didn't give us a clear idea of what was working and what wasn't. While we achieved some great goals, we were also doing a lot of things that weren't working for us. Setting goals -- and then measuring and tweaking them -- allows us to use every moment of our time wisely. So, YES there's a HUGE value in taking the time to set your social media goals. Now achieving my goals feels like a game to me. I can't wait to get my goals green in the spreadsheet. It's just too addictive once you get the hang of it. How do you develop or set social media goals? Do you feel it's important? Do you think it's too much work and slows down progress? The comment section is for you. I would love to hear from you!